All iOS devices include a clever sensor that automatically dims and brightens the screen depending on the ambient light. However, there will be times when you need to increase or lower the brightness of the screen. Managing this feature is easy via the Settings menu. Open the Settings app then tap Wallpapers & Brightness in the left-hand panel. The Auto-Brightness is enabled by default. You can de-toggle this, or tweak the brightness slider above using your finger to manually select a brightness setting. Next, lets set a new wallpaper image. Underneath the brightness control is a preview of the current wallpaper. tap on the preview to select another image. From the following screen you can choose from dynamic wallpapers that animate and respond to your movements, or a still image. Select either then tap on an thumbnail to preview the wallpaper. Once you’re happy with a selection you can apply it using the buttons at the bottom of the screen. 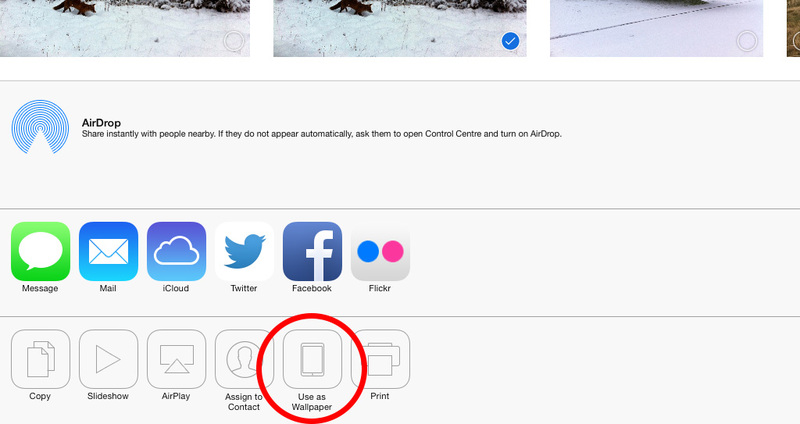 Alternatively, when viewing an image in the Photos app, tap the Share button in the bottom left corner of the screen, then choose Use as Wallpaper to set it as your background image. While previewing the image, you can use your fingers to scale and position it so it looks just right in the background. Finally, let’s alter the Auto-Timer, so your devices screen turns off after a pre-determined set of time. Open the Settings app then select the General button. Next, tap the Auto-Lock button. From the following screen you can choose a new Auto-Timer setting.